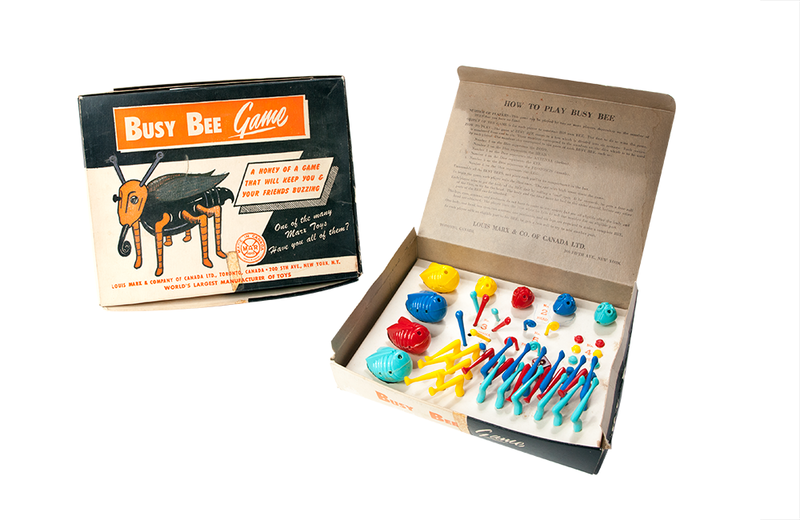 Released in the early 1950s by Marx, The Busy Bee Game draws inspiration from the now iconic Game of Cootie, which was produced by Schaper. Instead of building a “Cootie,” Busy Bee players must assemble a three-dimensional bee from a variety of plastic body parts. The Busy Bee Game package is divided into six sections. Numbered from one to six, each section corresponds to a specific busy bee body part. The part numbers also correspond to numbers on the single die used to play the game. Each of the two to four players must get the body of the bee first, by rolling a 1. A successful roll garners a free roll of the die to try for the head, with a roll of 2. Both body and head sections must be acquired before a player can move on to gather the other parts of the bee. A complete bee is made up of the aforementioned body and head along with two antennae, one proboscis, and six legs. Released in 1979, Guess Who? from Milton Bradley is a variation of the classic game of 20 Questions - a spoken parlor game that rose to popularity in the 19th century. Originally released in 1964 by Parker Brothers, Probe is a Hangman-style word game fun for the whole family. Sets are still readily found in thrift shops and on eBay for an accessible price.